Locally known as Ho Kaew Mukdahan, the 66 metre-high Mukdahan Observation Tower looms at the southern end of town and looks like something built for air traffic control. Views of the Mekong and across to Savannakhet are worth the entrance fee, even if the tinted windows in the air-con upper room make the scenery appear a little dark. The foyer and ground floor contain a collection of antiques and costumes along with background info on Mukdahan’s history. There’s also a decent selection of ancient pottery among other interesting knick-knacks, like an eagle trap, an elephant net and battle spears used when a tribe from Southern China invaded in the late 1800s. The second floor features a display on Mukdahan province’s eight ethnic minority groups, including some century-old photos and samples of clothing, various records of officialdom, a mouse deer skull, tiger tooth charm and a really cool palm-leaf recipe book. Up on the very top floor you’ll find a Buddha shrine, but the views are better from the larger observation room one floor down. Visitors can take a steep winding staircase to the top, or pile into a lift. Admission is 50 baht per person. 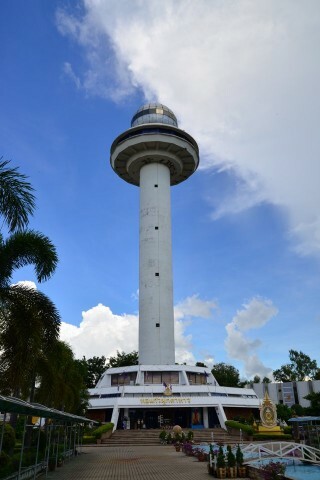 Mukdahan Tower is hard to miss at the south end of town off Samut Sakdarak Road, two km from Indochine Market. To get here, you can hop in a blue songthaew or pay a tuk tuk around 40 baht one-way.